At last the BlackCaps tour is underway. Most people probably aren't aware we've already won our first match. To be fair, it was a 'warm up' match, against Derbyshire and some would not consider that proper cricket. I don't subscribe to that theory at all. Mind you, I also follow teams like Germany when they play in International cricket matches. To me, cricket is cricket- no matter what level it's played at. Anyway, back to Derby. I wasn't quite sure what to expect of this match, but remembering how good the Queenstown warm up match was, I decided to make an effort to follow this one. There was no tv coverage, so I had to dial in and listen on radio with all the old codgers. I've never been a fan of radio commentary, but when there is nothing else, then I'll do it. So listening to cricket late at night on a BBC feed to my ipad was a new experience. And I actually think I'm beginning to see why people really like radio commentary. I've spent the last three nights tuned in to BBC Radio Derby listening to their feed live from the match. Charles Collins and Dave Jepson were the commentators bringing the match to us live. The first night was a bit strange because I am used to listening to New Zealand commentators who know the players well. So when I heard the commentator mixing up Rutherford and Fulton at the crease, I was a little put out. One is clearly very tall, whilst the other is not. But as the time went on, I realised that the BlackCaps were mostly new to these commentators and they confessed they were working it out as they went along. Well, thank goodness for Twitter then. The lovely Charles Collins, who endeared himself to all us late night kiwis, encouraged us to get in touch and share our thoughts with him. Consider the floodgates opened! It become clear very quickly that there were a number of late night kiwis listening, and we all had something to say. Collins did exceptionally well fielding all our corrections to players names with good humour and reading our player descriptions to help him identify Blackcaps in the field. It felt like being at a family gathering where everyone had a chance to speak, and we all shared the same jokes. By the third night, Collins was becoming more and more like everybody's favourite Uncle. While the cricket was going on in the background, he was telling all kinds of stories. For the morning session, he had Jake Needham sitting next to him and the pair of them became the main show, with the cricket in the background. At one point Collins was deep into his story about Footrot Flats and the similarity between Gillespie's shoulders and Wal Footrot's, and he barely paused to say that the bowler had released the ball and the batsman had a swing and a miss. I learned about The Unicorns cricket team and who they are. I heard about how Collins has just been through the coldest and longest winter he has ever had in Britain, because he was so delighted to see the sun out in Derby that day. So delighted in fact, that he mentioned it a few times. 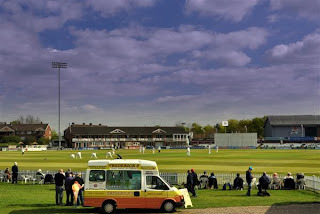 I heard the description of the ice cream van parked out at the Derby ground as Collins considered whether he'd be able to get an ice cream during the lunch break, then decided against it because the queue was too long. I even saw a photo of the ice cream van because someone at the ground shared it for us late night kiwis. I heard Needham and Collins carry out a protracted discussion about Wagner and how to pronounce his name. They were encouraged by the late night kiwis and given lots of advice on that one. Wagner featured a lot in that first session on day three. Collins was deeply impressed by Wagner and enjoyed watching him rattle Chesney at the crease. I listened to the story about February 1st 1981 and how Collins was at the MCG when that dirty piece of Australian bowling occurred. Us kiwis know all about it, but it was actually really interesting to hear an Australian tell their side of the story. All the while, us late night kiwis were tagging our tweets with #SleepingWithTheBlackCaps because that's what it was like. With the ipad under the pillow, I'd doze off every now and then, only to jerk awake with a yahoo when Wagner took another wicket, or when Bucko came on to bowl. 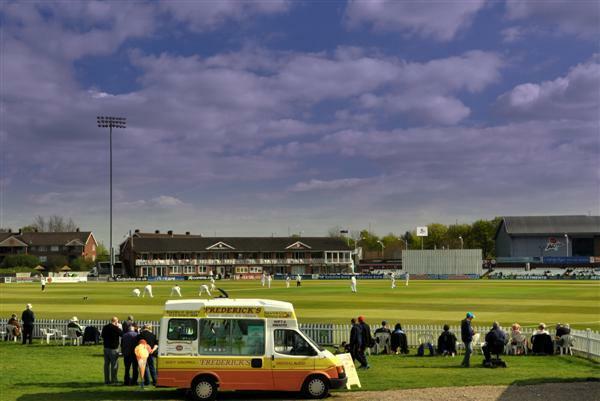 All in all, even though it was 'just a warm up match', it turned out to be fantastic good fun listening in late at night to an expat Australian (Collins) in Derby who was commentating about New Zealand versus Derbyshire. I even think that he might be able to identify all the BlackCaps by now. If not, he knows who he can ask for advice.